What is an Integrated Hoop?An Integrated Hoop contains programmable circuitry that controls the effects within the hoop. Effects are customizable in many different ways. The effects are only part of the hoop, each setup is designed to fit into 3/4″ outer diameter tubing and weigh less than 14 ounces (38″ 20 LED setup). Not only will it look great but it will feel great as well! Internally balanced batteries power your hoop for 4-8 hours (20 LED) depending on the modes used. Chromatica: contains a strand of RGB LEDs which uniformly cycle through many different modes. Standard packages available or customize your own modes! Each mode has 8 variable speeds! Flitter:uses two channels set up with any of the solid color LEDs that I offer in any pattern that are automated with the following patterns. Now also includes 8 speed variations per mode. Chaser: Uses 8, 16, or 24 LEDs (solid colors) and creates a chase pattern through the hoop. Currently comes with 36 animation patterns each with 8 variable speeds. Includes an auto cycle mode which automatically cycles through modes once every 8 seconds. Mobius: The Mobius hoop combines the elements of the Chromatica with the elements of the Chaser hoop and overlays them to creat 76,000 + total mode variations. What can the Integrated Hoops do? In short… Anything! I will be offering many standard effects in different packages but you have the option of mixing and matching your sequences/speeds or creating your own! 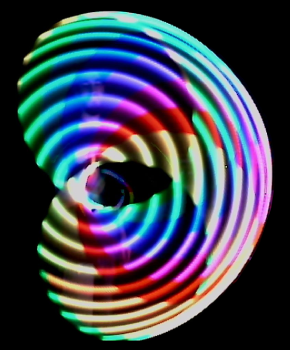 The Spectra Hoop has its own page now! Click here to see all the details!